Do lipid guidelines need to change just because there is a new, expensive drug on the market? NO! Shrank and colleagues published a viewpoint online today positing that lipid guidelines should return to LDL based targets. I think they are wrong. The use two studies to support their assertion. Current guidelines would recommend high potency statin in this patient population. 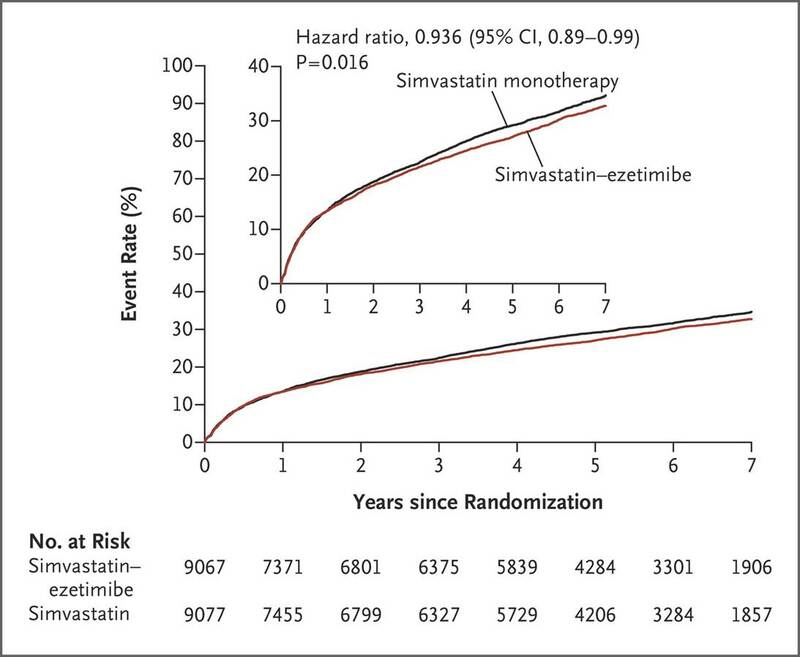 Adding ezetimibe to moderate dose statin is probably equivalent to a high potency statin (from a LDL lowering perspective). This study (and all ezetimibe studies) should have tested the difference between simva 40-ezetimbe 10 and simva 80mg or atorvastatin 40 or 80mg. So to me IMPROVE IT doesn’t PROVE anything other than a more potent statin leads to less cardiovascular events…something we already know. Now on to the 2nd argument. They argue that alirocumab (Praluent), the first in a new class, the proprotein convertase subtilisin/kexin type 9 (PCSK-9) inhibitors should lead to LDL guided therapy again. Why? “Early results suggest these drugs have a powerful effect on levels of low-density lipoprotein cholesterol (LDL-C), likely more potent than statins“. A systematic review of studies of this drug shows a mortality reduction but the comparators in these studies was placebo or ezetimibe 10mg. Why? We have proven therapy for LDL and this drug should have been compared to high potency statins. That study will likely not ever be done (unless the FDA demands it) because the companies making this drug cant risk finding that it works only as good as a high potency statin or possibly worse. Also does this class of drugs have anti-inflammatory effects like statins? Are they safer? This is an injectable drug that has to be warmed to room temperature prior to use and is very costly compared to generic atorvastatin. In my opinion, no guideline should be changed without appropriately designed outcomes studies for the drugs being recommended. In this case, the risk-benefit margin needs to be impressive to justify the cost as we have dirt cheap potent statins already. The authors of this viewpoint make no great rational argument for guidelines change other than that there is a new drug on the market and it might work. Lets see if it does and at what cost (both monetary and physiological). Underrepresentation of certain patient populations in RCTs informing guidelines: Does it matter? This week JAMA Internal Medicine published a research letter reporting data on the underrepresentation of women, elderly patients, and racial minorities in RCTs used to inform cardiovascular guidelines. The authors state that RCTs are considered to be the highest level of evidence that should be used to inform guideline development. I would argue systematic reviews would even be better but I understand that questions to be addressed in guidelines often need individual RCTs to answer them. They then state that “RCTs can have limited external validity”. What do you think? The authors evaluated all references and then focused on RCTs that were cited in the ACC/AHA guidelines on atrial fibrillation, heart failure, and acute coronary syndromes. They extracted data on age, gender, ethnicity, and continents from which subjects were recruited. What did they find? Female representation was highest in RCTs in atrial fibrillation (33%) followed by ACS (29%) and heart failure (29%). The next question you should ask is how does this compare to the actual gender representations of people affected by these diseases? In US registries of atrial fibrillation women make up 55% of patients, 42% in ACS registries, and 47% in heart failure registries. Thus women are underrepresented by up to 22% in these studies but does this affect guideline recommendations? Another way to think about this is would more data change recommendations for women? Hard to know for sure but I suspect not. If enrollment is properly conducted I would think that those enrolled would be a sample of all women with atrial fibrillation, ACS and heart failure. Even though the sampling fraction is smaller as long as they are representative of all women with those problems there should be no bias. The statistical inferences could be affected due to small sample sizes though but the overall qualitative findings (ie benefit or harm) should not be affected. As expected the majority of patients enrolled in these studies were white. Black patients constituted 19% of heart failure RCT patients and 6% of both afib and ACS patients. In US registries of heart failure, afib and ACS black patients make up 6%, 21%, and 11% respectively. Again I don’t have a problem with this if sampling was done properly. Elderly (defined as those >75 yrs of age) are very underrepresented constituting only 2% of patients in all the RCTs combined. In this case guideline developers will have to rely on observational data or use expert opinion to inform recommendations. Finally, the authors point out that 94% of enrolled patients came from North America or Europe. Is this a problem? I don’t think so for the US as ACC/AHA guidelines are developed to guide treatment of American patients. Patients from other underrepresented continents will have less direct evidence informing recommendations on their care. Consequently, those recommendations will be based more on expert opinion. A colleague of mine wrote a blog post on conflicts of interest that I want to expand upon and discuss my recent experience with. I am a member of a guideline panel (sponsoring organization not to be named) on screening for prostate cancer. I am the only primary care/internist on the panel (as best I can tell). The majority are urologists. Recently a revised guideline manuscript was sent around for comment. From my biased point of view (my intellectual conflict of interest) I was against several of the recommendations not only because the evidence didn’t strongly support it but also because I have to deal with the unhappy patients who undergo prostate cancer screening and are found to have something and ultimately get a procedure that worsens their quality of life. The urologists just couldn’t understand how I could be against screening all men and getting a baseline PSA at age 40. At one point I was referred to as “pathetic” that I would have such thoughts and teach my residents to follow the UPSTF recommendation against screening for prostate cancer in average risk men. Even the American Urological Association takes the stance to participate in shared decision making with men about prostate cancer screening. So why all the push back from my urological colleagues? The easy answer is financial. They make money from prostate biopsies and the surgical and hormonal treatment of prostate cancer. But I think it goes deeper than that especially since many are academic urologists and probably don’t have as great a financial incentive to evaluate and treat more prostate cancer (though I could be wrong). I think their intellectual conflict of interest is the main problem. Their research and academic beliefs are so strong that prostate cancer screening is good that they can’t see anyone else’s point of view (or view those views are equally meritorious). They can’t understand how I give greater value to the risk side of the risk/benefit equation. At least financial conflicts of interest are visible (when disclosed) and understandable. Intellectual conflicts of interest are usually subconscious and hard to overcome as I have found out. It will be an interesting face-to-face meeting this fall when we get together for another update. JNC 7 or JNC 8: Which Should I Use? I gave a CME seminar this week on treating hypertension in the elderly and after my presentation a clinical pharmacist asked me an interesting question: “What do you follow? JNC 7 or JNC 8?”. I thought this was an interesting question and one I hadn’t thought about at all. After all shouldn’t an updated guideline trump the previous one? I like JNC 8 because its methodology is more explicit and consistent with IOM principles than JNC 7. One can argue with some of the decisions made about the evidence review (ie that they only included RCTs and ignored systematic reviews and observational data) and be concerned about the degree of conflicts of interest of the panel members. But what JCN 8 did was make life simpler in that the BP goals are easily remembered: <150/90 for those over 60 yrs of age and < 140/90 for everyone else including those with diabetes or CKD (regardless of age). So for these reasons I prefer JNC 8. Is it perfect? No but I suspect they will address many of the concerns critics have expressed and further questions that need to be addressed in future updates (that they promise will come in a timely fashion).